It is a constant struggle for food bloggers to take appealing photos of food. In my five-plus years doing this, I’ve deleted innumerable photos of food that tasted amazing but photographed horribly. Fortunately for me (and you! ), Wikimedia Commons had a photo of this Greek tomato-and-bean dish which means I can now share one of the best recipes I’ve tried in ages. A while back, I bought a pound of large lima beans because… well, because that’s just what I do: I sometimes buy random packages of dried beans because I think they look cool and then they vanish into the backs of my cupboards until I pull them out later and go huh, large lima beans… okay, WTF am I going to do with this? 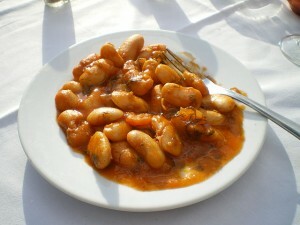 After browsing through a ton of lima bean soup recipes (meh, no thanks) I stumbled upon a recipe for gigantes plaki. Large limas are apparently not the same traditional Greek gigante bean but they are pretty frigging gigantic, all the same. Dried, these beans are about as big as the end of your thumb and once soaked and cooked, they’re probably double that. GIGANNNTTTTTE. Gigantes plaki seems to be one of those foods that has as many recipes as it has cooks [see also: adobo] but they all have a few elements in common: giant beans in a tomato and onion sauce that gets cooked (at least partly) in the oven, which is the plaki (meaning baked) part of the name. It’s traditionally served as a meze — a small dish served with drinks, a bit like tapas — but it makes an excellent vegetarian (or vegan) main dish. The recipe is somewhat time-consuming, between the soaking time and the longish cooking time, but for all that time, it’s not a lot of actual work — and the results are so, SO worth it. Start by soaking large lima beans at least 12 hours, or even longer if you can, changing the water at least once if it starts to smell slightly fermented. Drain and cover beans with fresh cold water by at least an inch and bring to a gentle boil. When the beans are nearly done, with just a little crunch left to them (anywhere from 45 minutes to an hour), start the tomato sauce. In a dutch oven or oven-safe skillet, heat 1/4 cup olive oil over medium-high heat. Add two red onions, chopped, and saute until onion are soft and starting to brown. Add 2-4 cloves of chopped garlic and saute another couple of minutes. Add two 15 oz. cans of chopped tomatoes with most of their juice, about a tablespoon of oregano, and about 2 tablespoons of red wine, if you have it. Let simmer for about 20 minutes while you preheat your oven to 350. Stir in about 1/2 cup red wine vinegar and a big handful of chopped parsley and let it cook for another 15 minutes or so. Remove the dish from the oven and let it sit for at least 10 minutes (mostly because it’s like freaking lava at that point). Serve warm or at room temperature with crumbled feta cheese on top (or chopped olives for vegans).